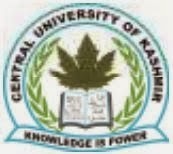 Educational Requirements: (i) Good academic record with at least 55% marks (or an equivalent grade in a point scale wherever grading system is followed) at the Master’s Degree level in the relevant subject from an Indian University or an equivalent degree from an accredited foreign university. (ii) The candidate must have cleared the National Eligibility Test (NET) conducted by the UGC, CSIR or similar test accredited by the UGC. Those candidates, who have cleared the State Eligibility Test (SLET/SET) accredited by UGC for eligibility for Lectureship held prior to 1st June 2002, are exempted from the requirement of NET. For SLET/SET held from 1st June, 2002 onwards, only those candidates are eligible who have qualified J&K State Eligibility Test (SET) for Lectureship. (iii) Candidates with Ph. D. Degree awarded in accordance with the University Grants Commission (Minimum Standards and Procedure for Award of Ph.D. Degree) Regulations, 2009, shall be exempted from the requirement of the minimum eligibility condition of NET/SLET/SET. (iv) NET/SLET/SET shall, however, not be required in disciplines for which NET/SLET/SET is not conducted.